Karina's Kreations: Stampin'Up Welcome Words Card! 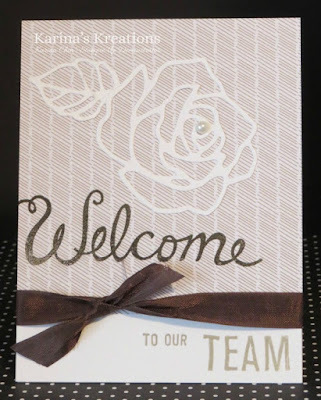 My friend Joanne joined my stamping team so I made her a cute card using the Welcome Words stamp set #140728. The starter kit is still on special until March 31 so if you're thinking about getting it here's the link just sign up here. The kit is $125.00 and you get $190.00 in product. It's a great deal. Plus you save 20% on all future orders. My card uses the Rose Garden Thinlit Die #140619, the Love Blossoms Designer Series Paper Stack #140548 and the Early Espresso 1/2" Seam Binding #143582. I hope my friend likes her card.